Trick-or-treating is magical -- especially as an adult. You put on your costume, say hi to energetic, bright-eyed tykes as you pass them on someone’s front porch, and then you ring... a stranger’s doorbell and ask for candy? For free? Uh, in what world? The reality is, you can’t really get away with trick-or-treating past the age of 12, nor would you want to -- those adorable costumed monsters are actually little real-life monsters. 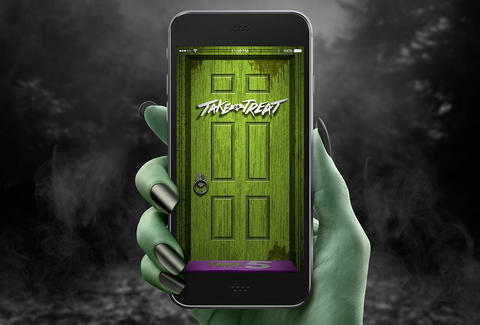 So the team at TAKE5, Nick Kroll’s favorite candy bar, are solving Adult Halloween’s biggest problem with a new app, TAKE or Treat Giveaway, that turns your phone into a virtual front door. Here’s how it works. Go to TAKEorTreat.com on your phone, then flip it over face down. Give it a quick knock as though you’re standing on the porch of some random family, and then turn it back over to open the door and see what kind of treat you got. If you are one of the first 3,105 people, you can get a bag of TAKE5 snack size bars shipped directly to you, or you could get Halloween-themed one-liners and GIFs. Because TAKE or Treat Giveaway is a web app that you don’t have to download, it’ll work on any mobile device (iPhone, Android… other). It uses your phone’s gyroscope and orientation sensors (which, don’t worry, yours probably has) to track which way the device is facing. The content is then displayed via canvas AKA <canvas> -- an HTML5 feature that lets you share videos, GIFs of puppies wearing Halloween costumes, and other media without using a ton of code or mumbo jumbo. You must be 18 or older to participate, and if you win a treat, you’ll have to be a little patient, ’cause they have to ship it to you. Some things you can do while you wait: marathon scary movies, browse pop culture Halloween costumes online, or carve a pumpkin (which is actually way harder than it looks, right?). And call your grandma while you’re at it. She misses you. Visit TAKEorTreat.com and start trick-or-treating. Pro tip: Do it in your jack-o-lantern pajamas. You’ll never be too old for those either. NO PURCHASE NECESSARY. Open to legal residents of the 48 contiguous United States (including DC, excluding AK & HI). Giveaway Period: 10/17/16 to 10/21/16. The first 3,105 participants who enter at www.takeortreat.com, will, subject to verification, receive a giveaway item, ten (10) TAKE5 Snack Bars (ARV: $2.12) (a “Gift”), which will be awarded on a first-come, first-served basis, WHILE SUPPLIES LAST. A total of up to 3,105 Gifts will be awarded. Once the 3,105 Gifts are awarded, no further items will be available. Please allow 2-3 business days for delivery. *Certain states will ship within 4 to 6 weeks (NC, SC, GA, NM, LA, TX, FL, AZ). To receive a Gift, the participant must provide Sponsor a valid mailing address (no PO boxes). For full rules and complete details, visit registration.takeortreat.com/rules. The Gifts are non-transferable, non-exchangeable, and non-refundable, have no cash value, and may not be combined with any other offers or promotions. Only one Gift per person during the Giveaway Period. Sponsor: The Hershey Company, 100 Crystal A Drive, Hershey, PA 17033.